Our gorgeous and loved purebred Blue-Point Siamese named Simon Kitty was diagnosed with lymphoma cancer in the kidneys after taking him into the vet Wednesday 5/4/16 because he wasn’t eating. We almost lost our precious Simon and he was hospitalised for the first 8 days after taking him in. Simon was hooked up to a catheter and given all tests and X-rays imaginable including having to be put under anaesthesia for a biopsy. Thankfully he is now at home but it’s a long journey ahead. We are doing all that we can to fight this cancer. Regretfully, we were not educated enough about pet insurance to have insurance for our little guy before this happened so all of these astronomical medical costs are coming right out of our pocket now and hitting us quite hard. The first 2 weeks already cost $15,000 in diagnosis and to get him back to a stable condition. We have enrolled him in pet insurance now but as we all know they will not cover pre existing conditions, so his upcoming 6 expensive months of weekly chemotherapy treatments (that are estimated to be another $15,000 to make it a whopping $30,000 dollars total!) also have to come right out of our pockets and we aren’t sure how to make it work as a low income family but we need to save Simon who is a son to us. Simon has this incredible will to live and loves his little family and is ADORED by every single person he meets. He is truly one of a kind and even the Dr’s feel that he can pull through this so we can’t give up on him! What he’s been through recently has been rough but he’s gotten through it even better than expected which is already a wonderful sign. We would like your help and the word to get out simply because the love that Simon brings his family is unmatchable and he is already showing so many good signs of improvement. You will be helping us elongate his legacy. 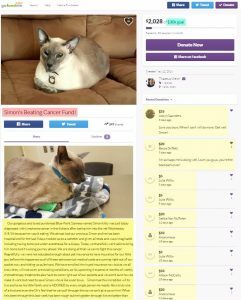 Many photos and the rest of our story can be found at our page https://www.gofundme.com/MrSimonKitty We have now become a very strong advocate about pet insurance. We urge all pet owners to get your pet insured, we have certainly learned our lesson. Cancer is a very expensive and scary situation. Thank you so much for your time. This article was posted in Development. « Pet Nest, an amazing pet bed you will love!